If God says no, can we appeal? Why did God tell Balaam he could go with Balak’s men but then get mad at him for going? Was Balaam not supposed to ask a second time after God said no the first time, and God said “fine, go!” but really didn’t want him to? The story of Balaam in the book of Numbers raises many perplexing questions, and you’ve highlighted one of the main ones. God seems to say no to Balaam at first. But he asks again, and God says yes. But then God opposes him. So can we really appeal a decision from God or not? Balaam is one of those enigmatic figures in the Old Testament who’s outside the nation of Israel but who seems nevertheless to have a relationship with the true God. Balak, king of Moab, feels threatened by the Israelites. He knows that Balaam is a diviner and so, in league with the Midianites, he sends messengers to bring him from Mesopotamia to curse the nation of Israel. Balaam waits on God for guidance overnight and God tells him, “Do not go with them. You must not put a curse on those people, because they are blessed.” So Balaam refuses to go. Undaunted, Balak sends a more impressive delegation and now, instead of offering the standard fee for divination, he promises, “I will reward you handsomely.” Still, there’s no reason why Balaam should even consider this offer. God has already told him the people of Israel are blessed and not to be cursed. But Balaam once again goes before God for guidance. So why does God tell him this second time that he can go? The reasons seem not to have to do with Balaam, but with Balak. God says, “Since these men have come to summon you” (that is, the large delegation of Balak’s high officials), “go with them, but do only what I tell you.” My suspicion is that God is seeing an opportunity to declare his purposes and his glory before a large audience, the leaders and people of two nations, Moab and Midian. God is prepared to work through Balaam to do that. I believe that God sovereignly accomplishes his purposes through the free choices, good and bad, of human moral agents. (This is how I relate divine sovereignty to human moral responsibility.) I think that despite Balaam’s bad motives for wanting to go—he was clearly after the reward and renown—God felt he could work through him in the situation. Balaam is so chastened by this that he offers to return home, forsaking the hoped-for reward. 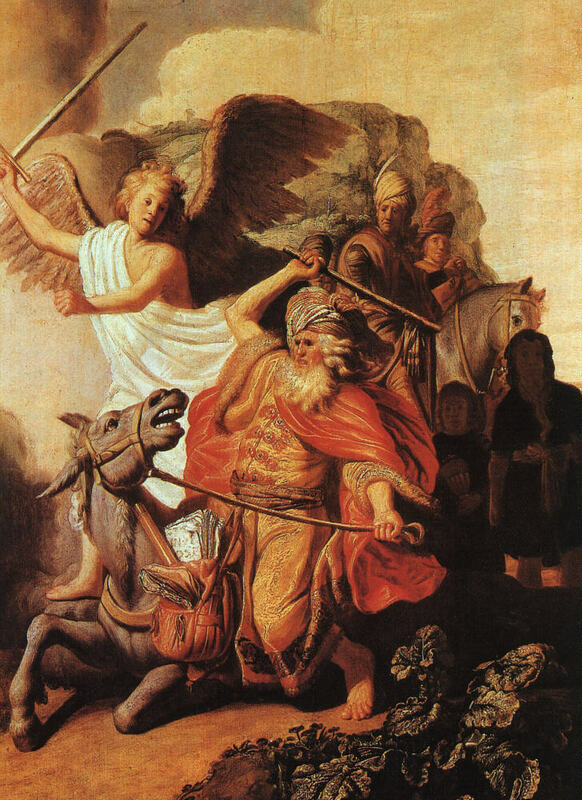 In view of this, God allows him to continue instead, but after a repeated warning: “Go with the men, but speak only what I tell you.” Hopefully the experience of seeing the angel of the LORD blocking the road with his sword drawn will stay with Balaam and keep him from doing anything foolish. At first it seems to. Balak gives Balaam three chances to curse Israel, but he blesses them three times instead. Balak then refuses to pay Balaam, who delivers four oracles of judgment against Moab and other enemies of Israel. God’s mission accomplished, right? Unfortunately not. In the very next scene, women from Moab and Midian seduce the Israelite men into worshipping idols, and in a divine judgment for this, thousands and thousands of Israelites are killed in a plague. It’s as devastating as any defeat they might have suffered in battle against these enemies. And who thought of this strategy? Balaam. But the Israelites fought back against the Midianites, and when they defeated them, “they also killed Balaam son of Beor with the sword.” He hadn’t gone back to Mesopotamia. He was still living with Balak and his allies, enjoying (briefly) the reward he’d received for finding a way to help them oppose Israel, even though God had told him only to bless Israel. God saw accurately that Balaam’s way was plunging into destruction and tried to warn him. But God didn’t take away Balaam’s freedom to choose. And since Balaam was an available agent, God worked through his choices to ensure that his purposes were publicly proclaimed. Balaam could have and should have taken warning from his near-death experience at the hands of the angel of the LORD. But in the end, his greed overcame him, he opposed God’s purposes, and he was destroyed. All of this leads me to conclude that while it might be possible to appeal when God says no, it’s a risky proposition, and not a very good idea. Previous Previous post: Does God change over the course of the Bible? Next Next post: Who was the book of Hebrews written to?